I suddenly realized that it is Friday! Working basically from home all the time and sometimes also on weekends, I sometimes forget what day of the week it is... Anyways, hurrah!! Friday!! So here I have a fun thing for you, three different snacks in jars. You could take it with you to work, give it to your kids for school or take them on a road trip. 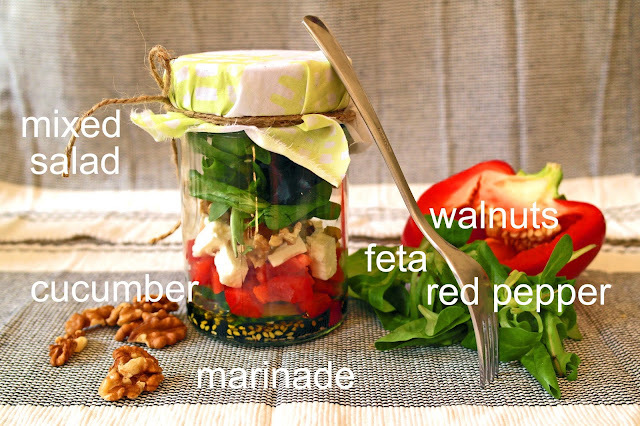 Kept in the fridge, all three sorts are good for a couple of hours.This is the best way to use up your leftovers. I used glas jars for two reasons: you can put them into the dishwasher; I don't like plastic jars. Always imagining that I taste the plastic. Perfect breakfast to go. I took my no-sugar-no-nuts-nothing-but-grain-muesli and mixed it with yogurt so that the grains will soften. 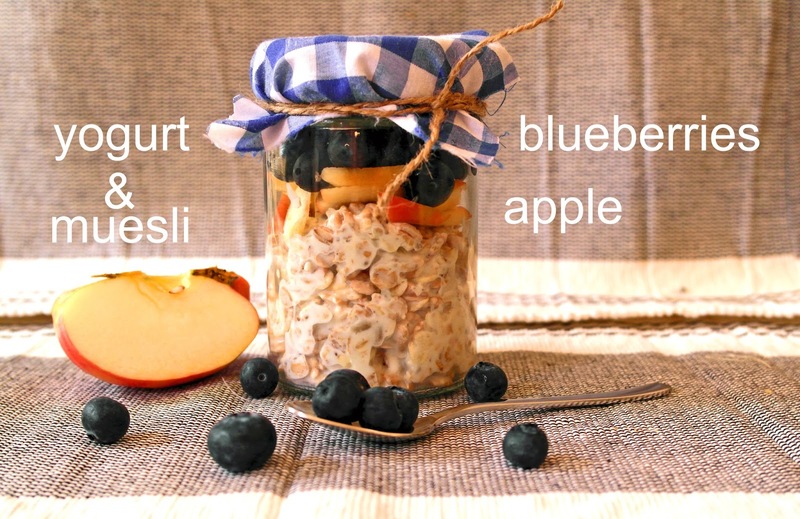 For taste (let's be honest, those mueslis taste like dust pressed into little clumbs) I added sliced apples and blueberries. If you're still not satisfied with the sweetness, add some honey (to keep up the good conscience). My favorite. Let's start at the bottom: For the marinade, I mixed aceto balsamico, olive oil, salt, ground pepper. And some sesame seeds, just to try out the combination. It works! I placed some cucumber slices on top of the marinade to seperate the rest of the salade a bit from the marinade. Then I added pieces of red pepper, feta and some walnuts. On top I placed a handful of mixed salad. so yummy. In summer I basically live off this salad and watermelon. 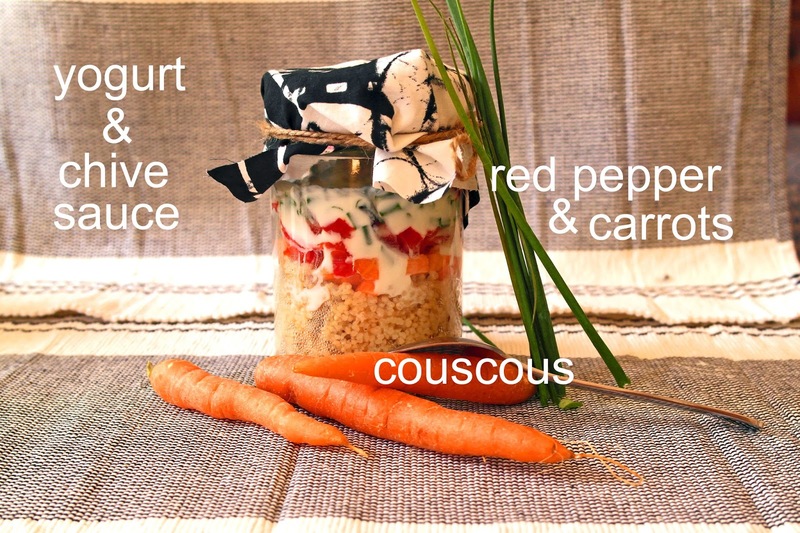 This is a couscous and vegetable snack, topped with a yogurt and chive sauce. Couscous is fantastic in summer, you can eat it warm or cold (as a salad for example), it's a light and healthy dish. I always make to much couscous, so this would be a classic leftover dish. (cousous: e.g. 1 cup of couscous + 1,5 cups of boiling water + salt +pepper, rest for 10min). I filled the couscous in first, then some finely chopped carrots and red peppers. For the yogurt sauce I mixed yogurt (haha), chive, salt and pepper and some grounded garlic (please DO NOT use garlic when taking it to your office/school, everybody will thank you). 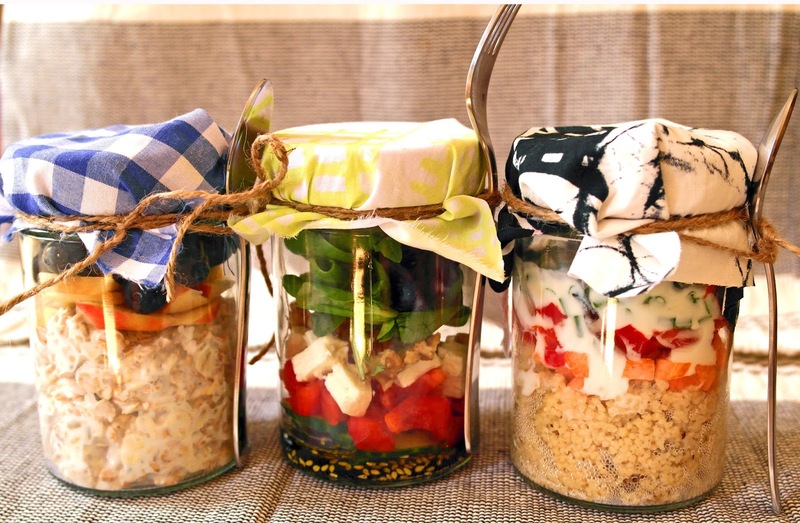 I think there are a million ways to fill these glasses, do you have a favorite recipe?